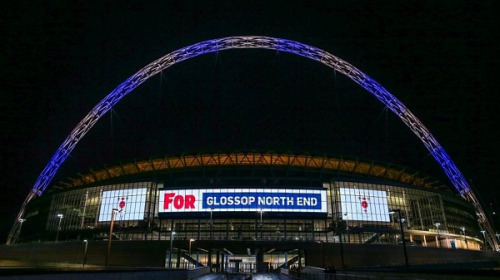 Our Plater Production team were delighted to see their local sponsored club, Glossop North End, 'in lights' at Wembley. The club's name was displayed under the home of football's arch as part of the FA's 10th anniversary of Wembley Stadium. Since opening, 160 domestic, European and international football teams have played at Wembley in a variety of men's and women's competitions and friendlies. Part of the 10th anniversary celebrations was to recognise all the sides that have played there since it opened. Glossop North End were included in this as they played at Wembley Stadium in the FA Vase finals in 2008.